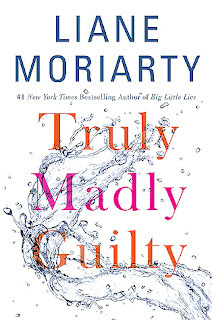 Truly Madly Guilty is another hit for the best-selling author Liane Moriarty, and after reading it, I can see why. I will admit it was not my favorite book by her, but I must give credit where credit is due. After discussing this with my book club, it is clear Moriarty knows how to entertain readers, make readers question their own actions and give readers opportunities to consider the what if’s. I’ll try to keep the spoilers light for those of you who have not read it yet. Truly Madly Guilty once again focuses on three different women (alongside the three men they are married to) with different narrators for different chapters. This plot also begins with the audience being aware that something has occurred and moves (more slowly than her other works) to the climax. In this particular novel, one woman’s marriage is becoming a little stale, one women struggles with infertility and one women faces accepting who she was in the past and how that will affect her school-aged daughter. But, because this is a novel by Moriarty, readers should know there will be much more to the characters and the plot. For instance, this novel focuses on a key dramatic event that occurs when all three women are at a barbecue. The incident involves a child suffering when her parents are distracted. Let’s just say the distraction involved alcohol, lap dances and classical music. Intrigued? The key event was hard for me to picture because the parent’s actions just seemed so far removed from the behaviors of my friends; however, the event did shake me because as she writes, “it could still have happened if they’d been distracted by a conversation about philosophy or politics or prize-winning literature.” For example, while I was engrossed in this book for a whole day when I should have been watching my two year old daughter, she managed to stealthily use a battery-operated filing tool to twist several chunks of her hair into tight balls. I almost had to cut them out. I was simply distracted by a book. The book works well for moms especially as they are familiar with being judged for their parenting (and judging others for their parenting). Moriarty does a great job of taking something outlandish and using it to make you question why you are better or worse than the characters – or what you would do facing the same decisions. This event was not as “big” or “dramatic” as other Moriarty’s other novels. In my mind, I envisioned a completely different ending (I’d be happy to discuss it with you sometime). However, it does lend itself to a great discussion. Our book club discussed toxic friendships, kleptomania, invitro fertilization, surrogates, strippers, hoarders, obsessive compulsive disorder, mental health issues, etc. It is one hot mess after another, which generally means it is a fun read. If you are looking for a book that will shock you and engage you, this is an excellent choice.